It took me a long time to offer secondary application editing because I didn't think it was needed. The personal statement is hard—you're answering a vague question about why you want to be a doctor. What diversity will you bring to the class? Is there anything else you want the adcom to know about? Why am I doing it now? Well, I had an email conversation with a Dean of Admissions at a good NY school and he told me that because personal statements are getting worse (hopefully that will change with my book), they are relying more on secondaries for their evaluation process. After helping students for several years with their applications, I'm finally realizing that you may want a little help with secondaries, so that's what I'm going to do. 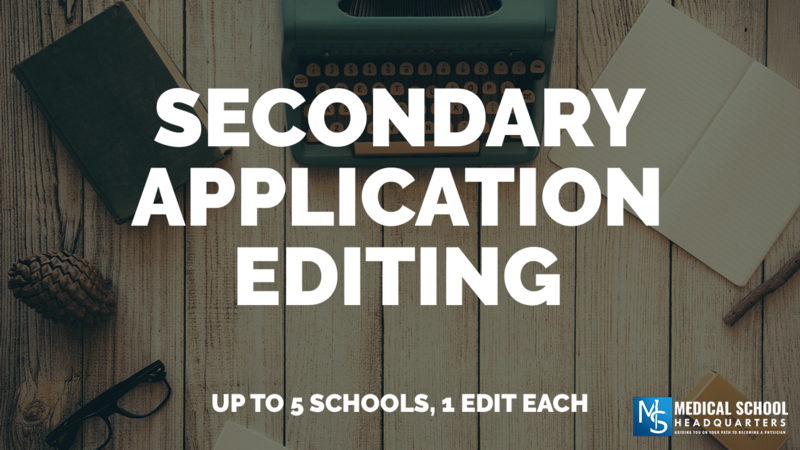 I'll read 5 school's secondary application essays and give you one round of feedback. After 5 schools, you're likely starting to repeat yourself in your answers, so you probably won't need more edits. The far majority of secondary essays I read are good and only need some tweaking. I still get a good amount of garbage answers that need to be thrown out, but those are few and far between. If you want some more confidence that you're submitting the best possible essay, let me help you craft your story. We'll look at up to 5 schools secondary applications essays and give you one round of feedback. That historically has been plenty of feedback, and enough schools to get you confidently writing the best answers to the secondary questions.